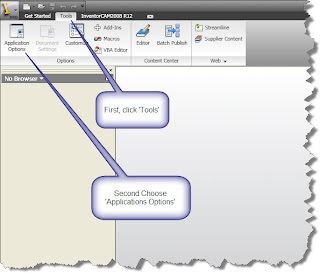 Inventor R2010 - Ribbons! We Don't Want No Stinkin' Ribbons! 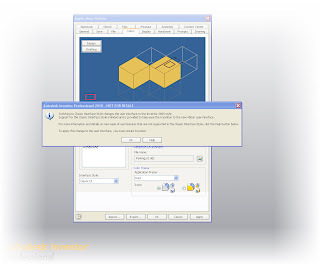 So now we're sitting with Inventor R2010, and the first thing you'll likely notice is the interface. I refer to it as 'Vista-ized', since with Windows Vista, we started seen the ribbons in Microsoft Office. Last year AutoCAD went to this format in R2009. 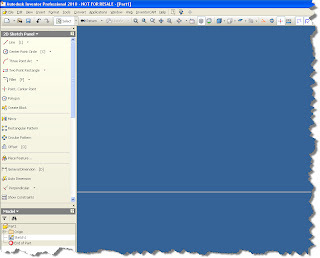 Even Snagit, which I use to take the screen captures you seen in this blog has gone to the ribbon. For my part, I like the ribbon. I've gotten used to it, and once I got over that hump, it liked what they did. But for me to say that I didn't struggle with a learning curve would definitely be an exaggeration. So if we need to go back to the 'Classic UI', here's how you do it. Now you'll see you applications screen, which is much like the same old one we saw before. Switch to the colors tab, and change from 'Ribbon UI' to 'Classic UI'. Once you hit either 'Apply' or 'Close', Inventor will prompt you to close and restart. Once you restart, Inventor R2010 will open up in the same layout we're used to seeing. Once you're ready to switch to the new interface, just repeat the steps and you can return to the Ribbon UI.